“Let It Be Me” is a popular song originally published in French in 1955 as “Je t’appartiens”. The score was written and first recorded by Gilbert Bécaud. The lyrics were penned in French by Pierre Delanoë. The English language version used lyrics by Mann Curtis and was performed in 1957 by Jill Corey in the television series Climax!. Corey’s version, with orchestration by Jimmy Carroll, was released as a single and was moderately successful. The most popular version of “Let It Be Me” was released in 1960 by The Everly Brothers. It reached 7th position on the Billboard Hot 100. The harmony arrangement of this version was often emulated in subsequent remakes. This was the first Everly Brothers single to be recorded in New York, and not in Nashville. the musicians that backed up the brothers on the record included Howard Collins, Barry Galbraith and Mundell Lowe on guitar, Lloyd Trotman on Bass, Jerry Allison on drums and Hank Rowland on piano. I would play this song. Note that the fourth and third strings are exclusively played with the thumb while the index finger plays all the notes on the third string and the middle finger plays all the notes on the first string. Here is an example of the notated arrangement showing the flowing arppegio style . . 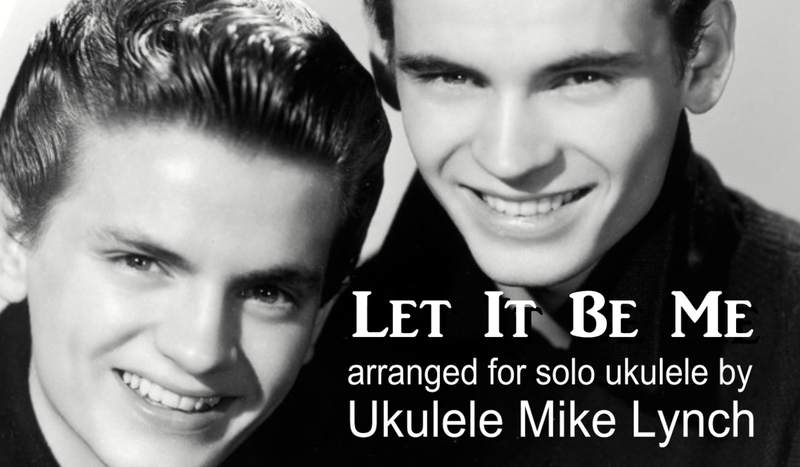 The tablature can be purchased for $5.39 by paying through the paypal button on the Ukulele Mike website: http://www.ukulelemikelynch.com Once purchased, I will personally email it to you as a pdf file for you to download.